show from It´s Just Music Baby! by It´s Just Music Baby! 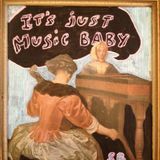 It&apos;s Just Music Baby! Thursday 18th December 2014 on Soundart Radio. A monthly radio programme on Soundart Radio celebrating the music of cotton goods / moteer and the family of labels that orbit around them. Special thanks to Craig Tattersall and Andrew Johnson of Moteer / Cotton Goods for their support and musical inspiration. Thanks to Chris, Dave & Lucinda at Soundart Radio in Totnes (twinned with Narnia), Devon. They like Sound, they like Art and they live near the River Dart. PS. The image is from a picture I bought in a restaurant / art gallery in Ejsberg, Denmark back in about 2006/7. Can &apos;t remember who the artist was, apart from the intials SB So if anyone does know her/him, then please say thank you on my behalf.